Cheap mall eats North Michigan Avenue. If you’re hitting the malls along north Michigan Avenue there are certainly numerous chain restaurants that are affordable. Here are the good quality, lower-cost, non-chain places to eat. All information was verified at the time of this post. Unless stated otherwise all prices are estimates and don’t include beverage, tax and tip. 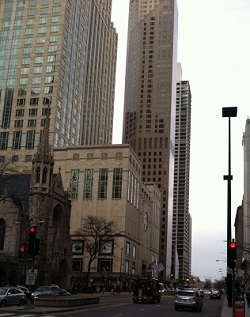 Allium, Four Season Hotel, 120 E. Delaware, 312-799-4900. Happy Hour M-F 4PM-6PM. Inside the 900 building take the elevator to the 7th floor. House white wine $6 and red $8, draft beer $5, well cocktails $6, bites $7-$12. Aster Hall 5th and 6th Level (Full post): This is my new go-to place. Beautiful space, reasonably priced delicious food, booze! Fooda Pop-up’s, 4th level, Monday-Friday 11:00AM – 3:00PM. Sign up for the Fooda and get $2. I saw a sign for a Dos Toros Taqueria in November 2018 but it’s not open yet. Foodease, Mezzanine Level, 312-335-3663, Foodease offers good self-serve food for breakfast, lunch and dinner. 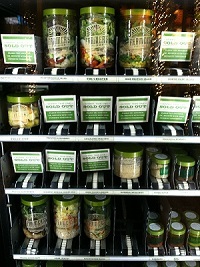 The selection varies daily and includes salads, hot entrees and sides, a salad bar, soups and sushi. Most items are sold by weight. You can easily get a full meal for under $10. There’s seating both inside and outside of Foodease. 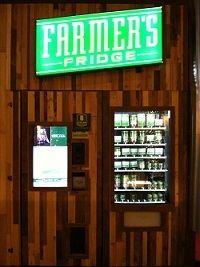 Farmer’s Fridge is a vending machine that serves healthy salads prepared fresh daily. Most ingredients are sourced locally. Salads range from $8 and up. Protein and other add-ons are extra. There are serving plates and utensils adjacent to the machine in wooden containers. Nordstrom, Habitant, 2nd Floor, (312) 464-1515 M-F 3-6PM. Select food and drink specials including $8 bourbon. Bongiorno’s Cucina Italiana & Pizzeria , 405 N. Wabash (312) 755-1255 Not in a mall.